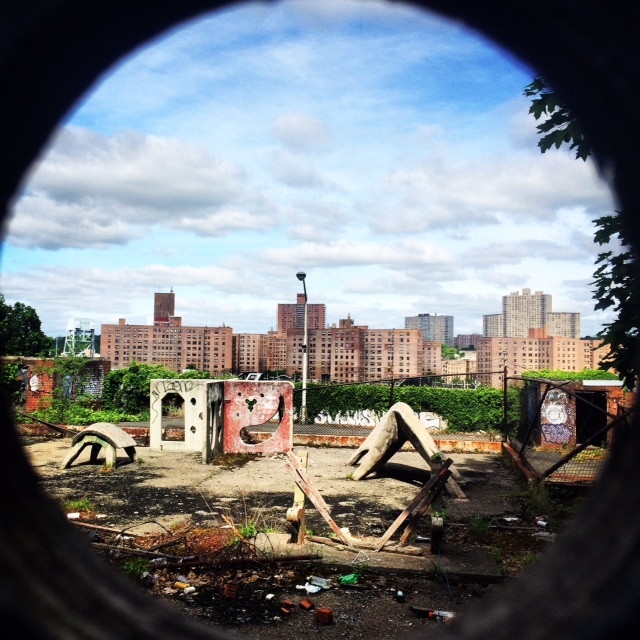 Next Steps to Revive Land Next to Bronx Step Street? On Kingsbridge Terrace in the northwest Bronx neighborhood of Kingsbridge Heights there is a significantly high step street heading down to Heath Avenue and West 229th Street that is in terrible, dangerous condition. At the April meeting of Community Board 8’s Traffic and Transportation Committee, The city’s Department of Design and Construction announced the reconstruction of that step street, with work beginning next spring and ending 15 months later if all goes well. It’s a much needed project that includes something cool: a path to roll your bike — instead of carrying it — up the steps. On a related note, yesterday, when I went for a morning run, I saw a large, neighboring bit of land through a circular hole in the wooden fence. The material on its grounds looks like former playground equipment. Anyone know what this was? Any plans to restore it? Thought I’d check it out with neighbors and other Bronx Matters readers before I checked in with DDC or other city agencies.